Anyone who has Christian friends on social media can relate to the public prayer requests: Job interview tomorrow. Prayers appreciated. Or Urgent prayer request! Mother is undergoing tests. Please pray that the results come back normal (as if God can just go in and tweak the lab numbers from his magic ipad). Then Christians respond with, “Praying,” “Just prayed,” “Family is praying,” “You are in our prayers,” “Hang in there! God is on the move,” “We claim victory in the name of Jesus!” or “Done,” confirming that the request for intercession has been granted. I’ve been trying to pinpoint, why these posts are so irritating and why I refuse to participate. It could be that I’ve been bewitched by Satan to writhe and convulse at the mention of prayer. But I think a more reasonable explanation lies in the fact that I’m convinced it doesn’t work and is thus an exercise in futility; I don’t want to pretend that talking to an invisible deity will change anyone’s circumstances and I wish others would stop pretending as well. I have to ask myself, what’s the harm? Why can’t I just go along with the status quo and at least say I will pray even if I don’t actually follow through? Don’t get me wrong. Sometimes I do give in. Like today, I signed a “get well“ card for an 84 year-old nun and felt obligated to end with the standard platitude, “Prayers for a quick recovery.” But for the average Facebook “fundy,” I have my reasons for refraining. First, I want to live in reality and make conscious choices based on truth. If I set aside superstition and the notion of invisible forces at work, I can clearly see that my friend in ND unfortunately caught a terrible virus, quite naturally, without the help of demons or angels. He doesn’t need prayer or holy water. He needs doctors and medicine to cure him. It’s that simple. 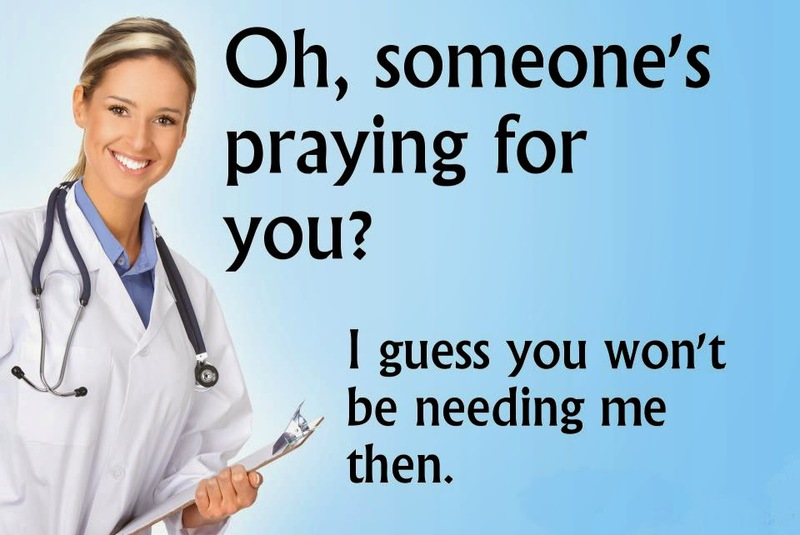 But offering to pray feeds the delusion that God is somehow necessary for John’s healing and gives false hope that a deity will come and save the day. Second, despite the outcome of the prayer, God is always vindicated because the system is rigged. If John gets better, people will say, Praise God! It’s a miracle! See? Prayer works! If he gets worse they will encourage the saints to just pray more because, while Christians would never admit this, apparently God’s hands are tied unless a whole bunch of people pray and beg at the same time. If that doesn’t work, they can also just blame Satan. And sadly, if John dies, they will praise God for relinquishing his earthly pain and allowing him to enjoy Heaven for all eternity. They will exclaim, “Look! John is completely healed, just like we prayed.” If my name, added to the prayer chain, adds credence to the myth that prayer works, I don’t want any part of it. If John hadn’t gone to the hospital he would likely be dead. No amount of prayer would’ve saved him. Third, agreeing to pray takes our eyes off of the real healers and heroes and deflects all of the glory to the invisible sky Daddy. If John hadn’t gone to the hospital he would likely be dead. No amount of prayer would’ve saved him. People have been praying for him since January, when he first started feeling sick and he got progressively worse. How does one explain that? When he was admitted to ER, his heart was only pumping at 25%, he had fluid around his lungs and severe edema in his legs. He was in such excruciating abdominal pain that he couldn’t eat or sleep. But since he’s been under a doctor’s care, he is finally starting to improve. It’s crystal clear that the doctors saved his life. But who will get the recognition? Why, God, of course! The doctors are mere instruments in the redeemer’s hands. God even gets credit for the right medicine being administered as well as the speed in which John recovers. And why does God get all the glory? It’s because people prayed and they believe he intervened. I don’t want my name added because I believe credit should go where credit is due. As near as I can tell, the invisible deity was nowhere to be found. The minute I heard John was being admitted to the hospital and his wife was going to take the train to be with him, I called her and offered to buy her a plane ticket so she could get there in just a few hours instead of 18 hours. She graciously accepted my gift and was grateful to be able to comfort him in the hospital during his most difficult moments. To me, offering a tangible expression of care is the best way I can show my love and support, even though I suspect my financial contribution will be interpreted as “God’s provision.” That’s okay. At least I know I did something “real” that had a positive impact rather than pretend to talk to an imaginary shaman and then make fictitious claims that the prayers were answered. Sidestepping the prayer requests is one small way for me to stay grounded in reality, and that’s why I refrain from the prayer chain. Care, yes. Prayer, no.